As with every day life, the trail comes with its ups and downs. The downs make me appreciate the ups with a greater intensity of gratitude. I leave Caratunk feeling refreshed and ready for the trail with my new shoes. 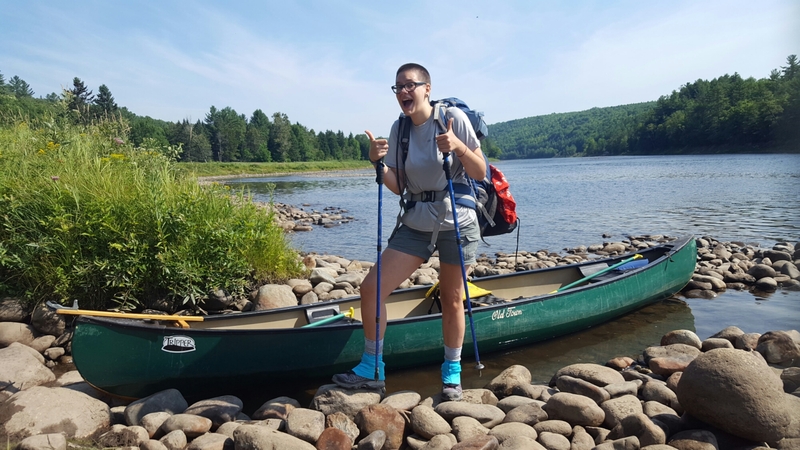 I arrive at the Kennebec river excited for the ferry. I hop in and grab a paddle without missing a beat telling the man “I feel like pocahontas!” It’s a beautiful day for hiking. I take off up the trail singing along to my music and enjoying the weather. I see a sign pointing east that says “waterfall.” I’m covered in sweat (an everyday occurrence) and immediately make the decision to get in! 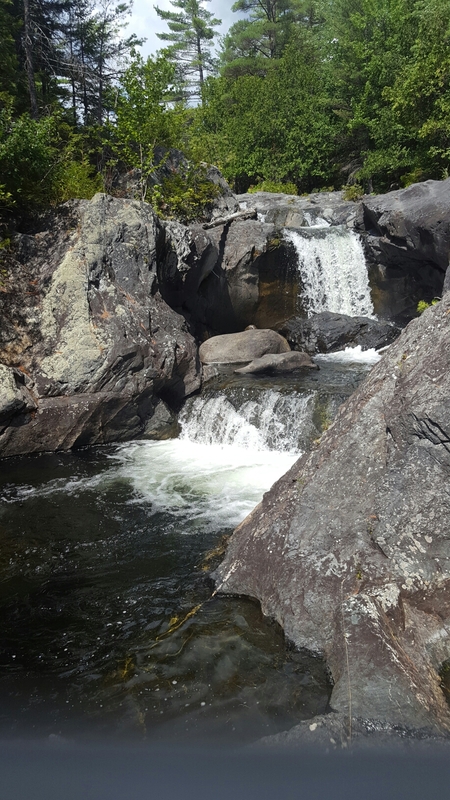 I don’t swim as much as others do on the trail simply because I cannot swim very well however, this waterfall has a perfect ledge of rocks for me to hold onto while I cool off. Feeling renewed, I continue on, stopping at the next shelter for a meal and to hang my clothes out to dry. I meet a fellow south bounder that I had seen in passing, exchanging brief hellos everytime. She introunces herself as Harold. She likes to take it easy and relaxes when she feels like it. Her hiking style is admirable to me as I often rush along the trail focused on my next goal of a shelter or a town. 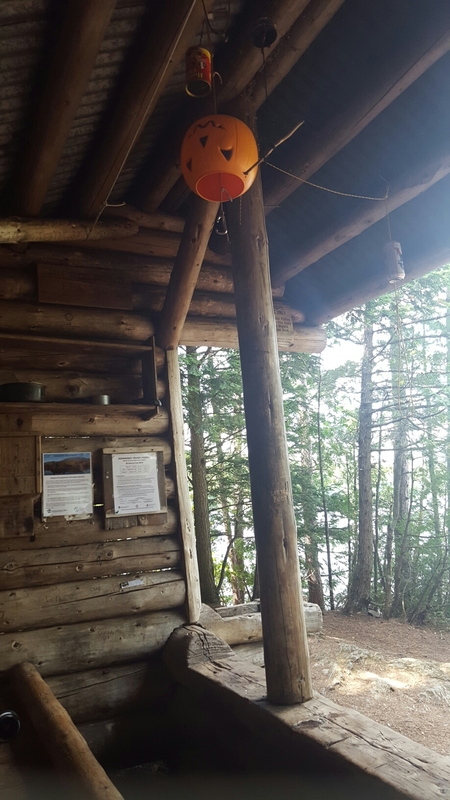 We laugh at the festive food hanger someone has placed a jack-o-lantern upon to deter rodents from climbing down the rope and eating their food. I end up staying a bit longer than anticipated. I look at my guide book. It is 2pm and I want to knock out 10 more miles. If I do this I will beat my personal record having hiked 14 miles total. A North bounder comments, “10 miles after 2pm? That’s pretty heroic..” I take it as a challenge and set off. The book tells me that 6 miles from the shelter is a sandy beach. I think of staying there for the night instead. When I arrive, I see that the “beach” is about 6 feet of sand l directly on the trail. I could potentially sleep here but decide against it and walk the 4 miles to the next shelter. I arrive just as the sun begins to set and think to myself, “I guess this makes me a hero!” I’m very pleased with my new shoes and new record. The shelter has 3 hikers in it already laying down for bed. As I’m setting up to make my dinner I hear someone whisper “Flicker! !” I turn and it’s Fine Line the girl I met in Caratunk. I’m very happy to see her again. We decide to hike together the next day. As I’m planning out places to stop for meals and water sources I see that there is a Bed and breakfast on an organic farm that offers work for stay. Fine Line agrees that this sounds like a great plan so we decide to check it out. They are very excited to take us up on our work for stay offer and pick us up along with a paying north bounder Wishing Bone. The bed and breakfast is more than either of us imagined! 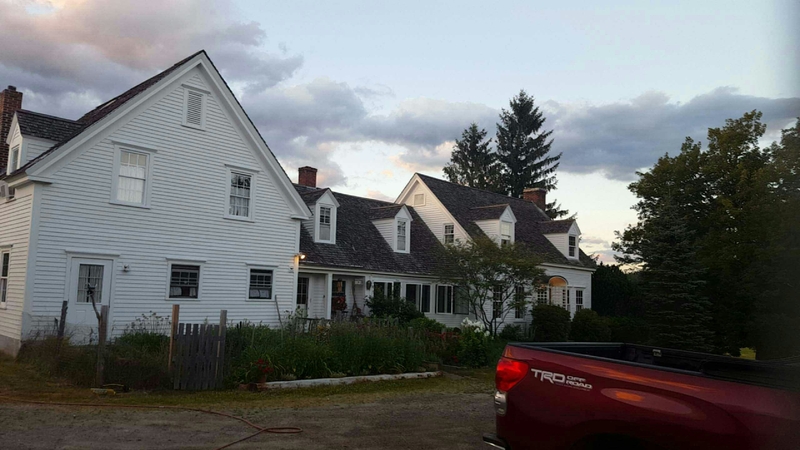 It’s a beautiful farmhouse on a large plot of land. There are chickens, geese, two dogs, and a cat. The home is decorated in a shabby chic style that I love with beautiful artwork on the walls. We are in love with the charm of the place and offer to work another day if they need the help. They are more than willing to let us stay a other day. They are holding a blues concert in the barn and could use the extra hands. For our work we weed the garden and direct the concert goers on where to park their cars. Afterwards we are told “Enjoy the show if you’d like to.” I dance, and have a couple beers and mingle with the locals. It’s charming towns like this that I could easily “get stuck” in, but we leave the next day and press on. The day after leaving a town is always slow going for me. I’m used to the lazy feel of town stays and it takes me a while to get my groove back. Fine Line and I hike together for the next few days. Hiking “together” for me generally means ‘let’s meet at this campsite for the night.’ I have yet to meet anyone that keeps the same pace as me and I like the time alone I get when hiking. It allows me to think, process life, sing songs to myself, ect. Fine Line and I hike together until Stratton. She is meeting her father in the next town so I continue on without her. I’m getting used to the flexibility of hiking partners. I can accept it when I know I may not see another hiker again. The old me struggles with being attached to people but the trail helps me be more fluid and teaches me to go with the flow. I hike on meeting more hikers and building friendships. 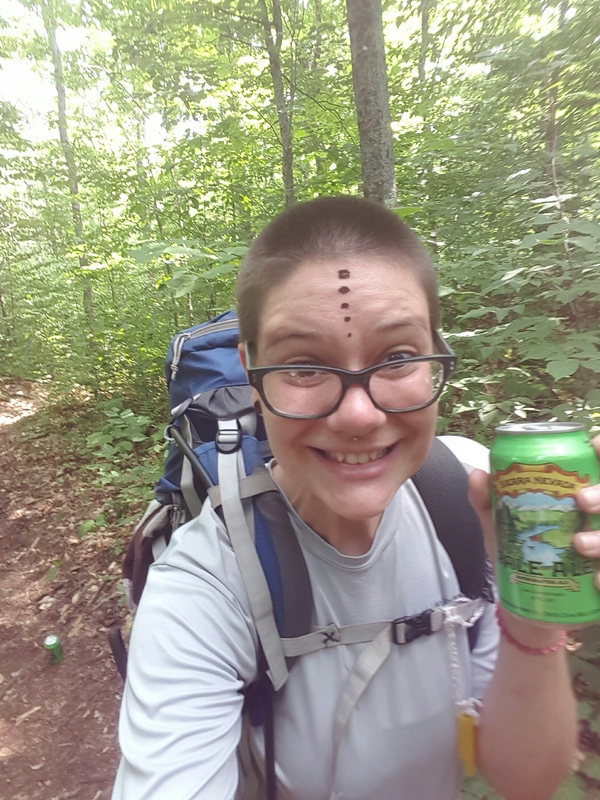 I experience trail magic in the form of beer placed in the middle of the trail. One night I awake after having slept 2 hours. It is pouring rain and I am in my tent because the shelter is full. The inside of my tent is covered in condensation and with every drop of rain I am sprayed with water. 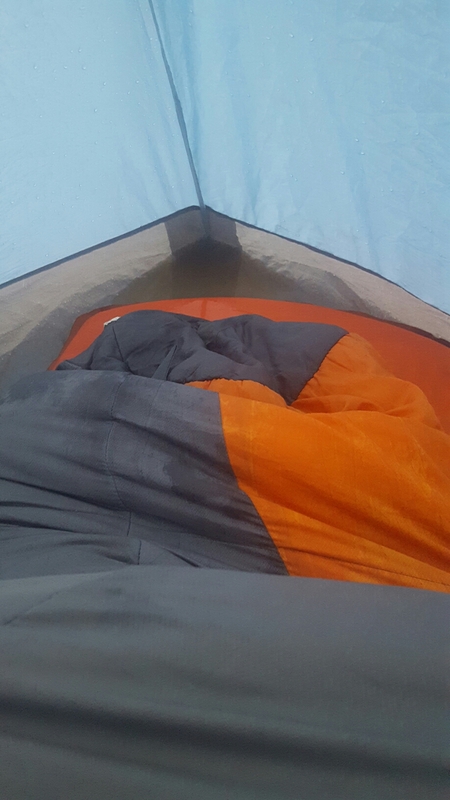 I scrunch up as small as I can towards the center of my tiny tent away from the rain. I try my best to sleep but lay awake for hours. I try to get comfortable and realize my sleeping bag is now also wet. There is a small lake forming inside of my tent. I consider hiking on in the night but eventually find one more hour of sleep. I awake and start wringing out my clothes, wet with a mixture of the rain I hiked in the day before and the water inside of my tent. My only ‘dry’ clothes I have I am wearing already and want to preserve so I have no other choice but to put on the freezing wet clothes I have to hike in. I pack up camp and walk over to the shelter hoping that the north bounders that stayed there last night are early risers. I am happy to see them heading out for the day and am able to make my breakfast out of the rain. I’m so cold and the rain is coming down hard. I debate on staying here for the day or moving forward. There are 8 people in the shelter and it is made to sleep 6. I’m shivering and a fellow hiker I’ve dubbed The Nurse notices. Without a word she throws her poncho over me and holds me like a child in her arms. She is a mother of two men my age and I cry at the motherly love she shows me. Another hiker named Tree boils some water for me to sip and a girl Dory gives me a space blanket to wrap up in as well. I am surrounded by amazing caring people and am reminded that we are all one human family. I decide that I need to move on to the next town because with my sleeping bag being wet I will not be safe out here. I wait and hope that another south bounder will brave the storm. Tree says he’s heading out so I take my opportunity to “piggie back.” The upcoming terrain is rough and above treeline for several miles. It is windy and slick. With another hiker going my way I feel safer hoping to use the buddy system. Tree is much faster than me on this day and my safety plan foils as he hikes on ahead. I slip on a scatter of boulders and fall forward. 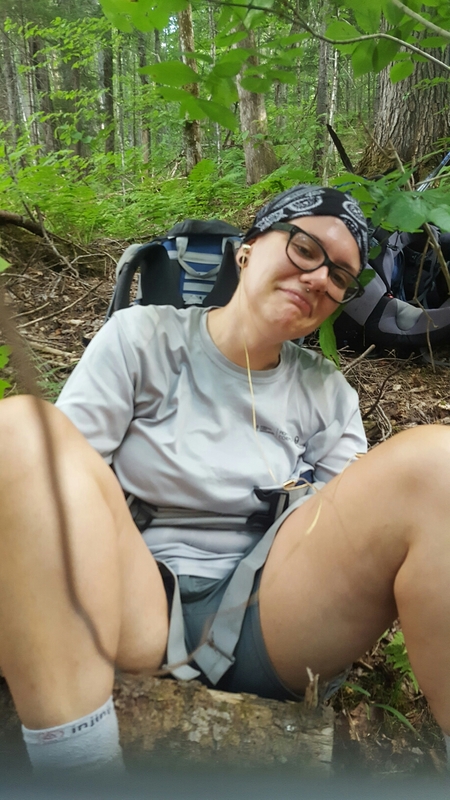 I hit my knee and try to stop myself with my hands but the weight of my pack comes down on me smacking my face against a boulder. I am grateful that the rain and mist made my glasses useless and I am not wearing them for they would have surely broken on impact. I am also grateful that I am wearing my rain jacket, as the hood created a barrier between my face and the rock and I am not bleeding. I immediately feel a goose egg forming and my pack has me pinned down. I cry like a child on the playground that has skinned her knee. I know that if I stay here like this much longer I am at risk for hypothermia so I tell myself to get up and I hobble on. My knee is a little sore but I can walk and I feel the strange dejavu I’ve experienced after concussions in the past but I’m ok. I eventually catch up to Tree who is bleeding from the knee also having fallen and we are both grateful to see that the other is ok with only minor injuries sustained. We walk together for the last leg into the Hiker Hut Hostel. They are very welcoming despite the late arrival. They offer me a hot outdoor shower which I gladly accept along with clean, dry town clothes. They feed me lentil veggie soup made with fresh vegetables from their garden, served with bread, a beer, and blueberry pie. I am so grateful to be warm, clean, and full. I drift off to sleep knowing that this day has made me so much stronger than I was before.